“The scene begins with a hermit’s melody sung by a bashful bird, hung in a violet sky. There are no words, but there’s understanding. It’s been so long, since I’ve heard that pretty voice. Raise up the lights, and enter hero-girl. She makes me calm. God, she makes me calm. And then she hears the song, and she starts singing. It’s been so long since I’ve heard that pretty voice. Strike up the band. Here comes the storyline about the usual struggle between fear and love. This is the lifelong song that we’re all singing. It’s been so long, since I’ve heard that pretty voice. I’ve been a little obsessed with northern Minnesota’s Cloud Cult lately, even though I’ve been listening to them for a few years. Their latest album, “The Meaning of 8,” is epic. On top of making beautiful music, the band’s environmental conscience knows no limits. Before switching to recycled cardboard CD cases, they took in used jewel cases and hand-washed them all to package their own albums. When I recently ordered a CD from them, it arrived in my mailbox with a mailing label simply stuck on the shrink-wrapped cardboard case. No wasteful packaging. The t-shirt that followed came wrapped in a used brown-paper grocery bag. They’ve even opened up their own record label, Earthology Records (which they have stated they have no intentions of abandoning in favor of a major label deal), and provide similar eco-services to other bands. The band also plants trees to offset their carbon emissions from touring and purchases wind energy credits to compensate for energy used to power amplifiers and lights and the such during concerts. Besides gorgeous video and light shows, their live shows also feature two painters (who are full members of the band, one of them is band leader Craig Minowa’s wife Connie) creating original pieces that are sold through a silent auction each night. Really beautiful stuff; Rosie and I hope to have one to hang on our wall someday. This entry was posted in Uncategorized and tagged music on Wednesday, April 25, 2007 by Greg. 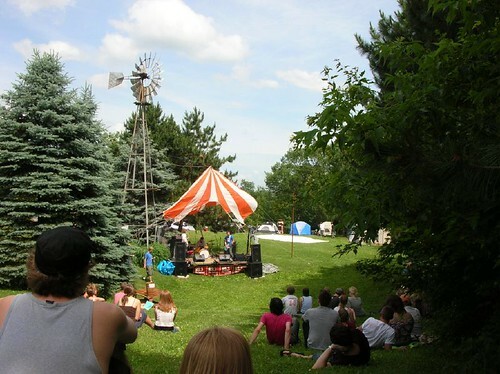 This entry was posted in Uncategorized and tagged minnesota, music on Tuesday, June 20, 2006 by Greg. I simply had no idea. I had no idea what people in my town will do to support the bands they love. I had no idea how many people love a bunch of guys from Duluth who play a rockin’ style of bluegrass and call themselves Trampled by Turtles. I just had no idea that this state could continue to surprise me like it did on Friday night. It was cold. After a balmy winter where it hasn’t gotten below 25 degrees Fahrenheit for weeks at a time, Thursday and Friday last week were cold. Minnesota in February just-like-it-should-be cold. A strong northwest wind brought windchills of -25 to -30, making life just dangerous enough. When I finally got out of work on Friday, all I wanted to do was go home and spend a couple hours on the couch with a beer. Unfortunately, the doors for the show were at 6:00. And, like I said, it was cold. I won’t deny that not going crossed my mind. I’m glad I didn’t give in to that temptation. I got a little worried that a lot of other people would and on the drive over, I had visions of First Ave.’s cavernous space occupied by just a couple hundred of the most ardent fans. Two hours later, I would marvel at my ignorance. We picked up our friends Wrench and Nurse and headed downtown. When we got inside, my worries about the turnout seemed to be validated. Sure, no band would step foot on stage for another half hour or more, but there seemed to be just a few dozen people lost to the shadows when we got inside. The image of the solid mass of people that would pack the venue at the peak of the night was unimaginable. The first act was a late addition to the bill, the side project of Alan Sparhawk â€“ singer and guitarist of Low, who the Turtles opened for in December, which nicely underlines the feeling one gets of Duluth coming down to the Twin Cities for a night every once in a while â€“ under the unassuming name of the Retribution Gospel Choir. This was the second time I’ve seen them play, and words still fail me in trying to describe their music. The easiest thing to do might be to compare them to some other bands, but that proves to be the hardest thing to do. Maybe a little bit of Neil Young or Flock of Seagulls, but as soon as that or any comparison comes to mind, the next bar of the song shatters it. There was definitely a sense of post-rock to the performance, down to their tendency to fade from one song to another, leaving little space for the audience to applaud or absorb. It got me to thinking that maybe they were trying to make a statement that they didn’t need the audience’s validation or approval. Which later in the set got me to thinking that while they might have just been trying to exhibit indifference or modernity (two of rock’s unavoidable tendencies), they were robbing their audience of a powerful aspect of consumption: the ability to express ourselves right back at them. An audience needs to applaud â€“ or whistle or yell or something! — every so often. They didn’t get much of it with the Choir. Don’t let all that verbal staggering lead you to think for a second that their set wasn’t enjoyable. For everything I know, maybe the music was the direct descendant of some previous tradition, and maybe the Choir just didn’t want to stop rockin’ long enogh to let us clap. I was so distracted by the strange sights and sounds of the Choir that I hardly noticed the club slowly filling up. There may be no better chaser for Maker’s Mark than Premium. When I went to get another beer after the Choir left the stage, I found myself having to weave between clumps of people. Everyone seemed to be laughing. Beer was being rapidly consumed by one 24 oz. bottle of Corona or Newcastle after another. And Premium. Oh, blond-headed stepchild. The next act up, White Iron Band, was one I had heard of in passing, but the only thing that stayed impressed on my mind was reading somewhere that they had been voted best country band in Minnesota in some poll last year. I thought they could be all right, but I was waiting to see. The movie screen that serves as a curtain at First Ave. â€“ this night alternating surreally between “Mystery Men,â€ “Forrest Gumpâ€ and “Being John Malkovichâ€ — went up and revealed a stage full of musicians. The lead singer could have just got off a construction job site in his boots, grungy jeans and flannel and headband. The rest of the seven guys seemed to occupy some step on the spectrum from roofer to hippie. The stage was still and silent for just a moment, then it exploded into sound with the leader ripping away on the harmonica and everyone else joining in on a song that was a long way from my ideas of country. Rhythm filled the place. The band played a far-reaching set. The music touched on country, but just as often it was a flavor of blues and rock. One of their last songs was about Minnesota and when they shouted out a line about drinking Grain Belt, many bottles were raised in the air. When it was finally time for the Turtles, people were lined up six deep along the railings of the balcony. In the absence of a band on stage, my ears were filled with that strange symphony of the busy club: the cacophony of clinking and clanking, the voices yelling over each other. The energy level had been set high for the headliners. When Trampled by Turtles took to their folding chairs on stage and started playing, I thought I detected a certain tightness. This show had been on the calendar for months and I’m sure they had been looking forward to it. Now that they were finally on stage, they seemed like they might be just a little nervous. They played perfectly well, but their usual accelerated style of playing seemed ever more sped up than usual, and they played without hardly looking out at the exuberant crowd at their feet. They played tight all the way through the first two or three songs (the names of which I couldn’t even guess at, as I have a terrible memory and I didn’t bring a notepad and pen… I really rarely intend to write about shows, it just kind of happens, which might be hard to believe as I reach word 1140…), but slowly the fun broke through and you could see them start enjoying it. We had run into three friends during the White Iron Band, they now went to get on the floor. We joined Wrench and Nurse along one corner of the balcony and watched for the rest of the night from there. I couldn’t believe how many people we ran into. A friend of mine from work and her boyfriend; a college classmate of whom I have hazy memories of a semester of giving her a ride to a political science class; a coworker of Wrench’s who I’d hung out with once before at a 2-for-1 Tuesday night at the Triple Rock. Then there were all the people that I recognized from previous shows, especially for Duluth bands like Low or at the Green Man Festival. The Turtles played a great set. They were lined up in the usual order across the stage, beginning at left with the long-haired mandolin player, then the bearded Nordic banjo player, then the guitarist and frequent singer, and on the right, the bassist. They look like the kinds of guys who were simply destined to become friends at college and start playing first in basements, then bonfires, then some bars. Now, this night, headlining for their first time on the most famous stage in the state after a successful year of touring around the country and recording. Late in their set, the harmonica player/singer of White Iron Band, the drummer from the Retribution Gospel Choir, a fiddle-playing friend and a washboard player came on stage for a big floor-buckling version of Bob Dylan’s “Isis.” The crowd moved as one, and even up in the usually-sedate balcony, a few clusters of drunks danced enthusiastically through, colliding occasionally with those of us who like to stick to foot-tapping and head-nodding. The Turtles played two encores and could have played three. When the lights came up and we knew they wouldn’t be coming back to the stage, we collected our coats from the coat check and bundled up against the freeze that was still outside the doors. I had lunch last week with a guy who’s been doing executive recruiting for a long time (and no, it had nothing to do with recruiting me, I have a ways to go before anyone wants to make me a vice president of anything). He said that Minnesota has a reputation as the hardest state to recruit people into, and the hardest to recruit them out of. There are lots of reasons why. Last week, it seemed appropriate to tell him about meeting a friend at a bar in Minneapolis on a Saturday night last fall and the two of us having a near-wilderness canoe trip on the St. Croix not 10 hours later, and me making it to dinner at my in-laws for Sunday dinner. Friday was another exclamation point. This time it was the sense of community, the sense of depth, the strength and the insanity of the people and the place. With the wind ripping down the concrete canyons of downtown Minneapolis, I looked down from the balcony and knew that no one in that tightly-packed, constantly-moving crowd could feel the chill. This entry was posted in Uncategorized and tagged minnesota, music on Monday, February 20, 2006 by Greg. Coming back to Minneapolis on Friday night to play at First Avenue, it was almost like Low had never been gone. But in ways, it seemed like they might never really be back. Just like how the inevitable effect of time and travel sustains the phrase, “you can’t go home again,” so does a highly-anticipated album, murmurs of a “breakthrough” in the charts, the adoration and expectation of critics and the fans, surely change a band in ways that can ever be reversed. The very entertaining Duluth bluegrass band Trampled by Turtles opened up, though only playing about six songs. The foursome’s ability to provide their expert musical roller-coaster of unbelievably fast tunes mixed with slower, thoughtful numbers in such a short set was as admirable as anything. They seemed to be having a lot of fun, which infected the entire club, doing exactly what any audience expects from an opening act. The only reason they left the stage seemed to be so that Low could punctually take the stage at 8:15. The stage that Low stepped onto was ringed by five little Balsam Fir Christmas trees. But, because the trees were unlit and undecorated, it felt more like the band was playing in the middle of a forest or a tree farm than anything else. Which isn’t necessarily a bad thing for a band like Low. It also hinted at just how packed that stage would get during the show. For a band that has shown up on even the largest stage with nothing but a drum and a high hat, a couple amps, and the players themselves, Friday night’s show was very different. When they came on stage, Low was not alone. A choir of six or seven people squeezed in between two trees. Eric Pollard, who plays drums in Alan’s side project The Retribution Gospel Choir, joined them as well, a departure from the usual minimalist percussion provided by Mimi. Friend Marc Gartman (of No Wait Wait and several previous projects), sat in back with a lap guitar. And, as we knew would be the case, bassist Zak Sally wasn’t there. In his place stood Matt Livingston, who in no way brought to mind Sally. In a red cardigan, a black dress shirt buttoned up to the neck, and thick-rimmed glasses, Livingston looked like he would have been more at home on stage with Weezer than Low. But, nobody expected him to be a new Zak Sally, but just to play the bass, which he did admirably all night. The concert was dominated by Christmas tunes, but they were all the sort of songs that remind us what Christmas is supposed to be about: a beautiful little baby, peace and joy, hope. There was no “Jingle Bells” or “Over the River and Through the Woods” here. In an interview with The Pulse of the Twin Cities last week, Alan said that the show would be about two-thirds Christmas music. He wasn’t joking about the proportions. The show was neatly split up into thirds. The first third was made up of several Christmas songs, including “Little Drummer Boy,” accompanied by the choir, Pollard, and even the Turtles, who came on stage to play along on one of my favorite Low songs, “Just Like Christmas.” After that song, the choir and everyone else left the stage, leaving the core members of Low alone — though appearing lost amidst all the equipment, instruments and trees still on stage — to play a set of non-Christmas tunes from their back catalog. Where they had made the Christmas songs rich, layered compositions, as we would expect considering the band’s musical trajectory of the last couple years, in this middle portion they seemed to make a concerted effort to return to their “slowcore” roots. The set featured strong and steady work on the bass by Livingston and a really beautiful, sparse rendition of “Blue Christmas.” It was sung by Mimi, who has a tremendous voice which she has often seemed too shy to really set free. On this and a few other songs, she sang more confidently than I have ever heard, a treat made all the more special by its rarity. Over the course of the night, Alan’s banter seemed a little precarious. Not the least because at times his performance seemed a little precarious, missing a couple entries and seeming to forget a verse here and there. He seemed to lack his usual confidence and the audience seemed to listen closely whenever he spoke between songs, as if we were all playing the role of psychiatrist, trying to glean some understanding of his tormented mental state from his spoken words. But, we were not psychiatrists, Alan was not reclined on a couch, and he spoke so close the microphone and so deeply that it was actually difficult to understand a lot of what he said. If anything, his shaky presence seemed like it might be the result of feeling the crowd’s expectation of seeing a mentally-troubled musician. I got the sense that he would have liked it if no one was privy to his problems and he could just simply entertain and enlighten as he and Low have done for years. One thing that Alan did say in the midst of thanking the choir and all his friends that had joined him on stage, and saying how they were all talented musicians in their own right, was his lament that there was one talented musician that was unfortunately not there, obliquely noting an absence that everyone couldn’t help feel. But, it wasn’t just the audience that made the show seem a bit like a therapy session. With all the people on stage, and with Alan’s widely-discussed mental health issues, one really got the sense that getting back on stage was a challenge for Sparhawk, and that the other people weren’t there so much to provide the “wall of sound,” as had been promised, but to show their support for their gifted friend. Photos of the concert by Chuck Olsen are available on his Flickr blog. This entry was posted in Uncategorized and tagged music on Monday, December 12, 2005 by Greg. Blogger/homesteader extraordinaire Deb of Sand Creek Almanac has bravely (and wisely) chosen to share some of her music with the world of the internet. She was lacking a place to host the mp3 in question so I’ve put it on my server. She recorded it with her friend “Mando Man” Fred Keller on mandolin. The song is a cover of Greg Brown’s “Early” and it’s really, really good. If you want to hear it (and I know you do), right-click on the link below and choose “Save as…” to download it. Please don’t try to play it directly off my server. Also, I’ll probably have to remove the song in a month or so. This entry was posted in Uncategorized and tagged music on Friday, October 14, 2005 by Greg. ‘Bout a funny ol’ world that’s a-comin’ along. It looks like it’s a-dyin’ an’ it’s hardly been born. I was watching part two of the new Dylan documentary by Martin Scorcese, No Direction Home, when Canoeman came to pick me up. It was a really great show, focusing on Dylan’s departure from the Iron Range, the path that brought him to Greenwich Village, and how he quickly became famous and fascinating. But I turned it off and went to listen to a folk/blues musician from Duluth — Charlie Parr — at a bar in Dinkytown. Where we sat toward the back I couldn’t see very well; a support pillar stood between me and the singer, all I could see was his boot tapping on the stage and his fingers on the frets. It could have been Dylan up there, it could have been 1961. But it wasn’t. It was 2005. 2005. A time when I don’t think we can describe where we’ve been lately any better than we can say where we’re going. Anyway, I just thought that was kind of a funny set of circumstances. Is to say I’ve been hittin’ some hard travelin’ too. This entry was posted in Uncategorized and tagged music on Thursday, September 29, 2005 by Greg.